Provided photo John Stephens, superintendent of Arcanum-Butler, and Chad Beanblossom, vice president of regional campuses at Edison State, meet to discuss their partnership of the new Agriculture Education building. ARCANUM — Arcanum-Butler School District is just weeks away, weather permitting, from breaking ground on a new 20,000-square-foot multi-purpose addition to the campus. With the strong return of Agriculture Education as a satellite partner with the Miami Valley Career Technology Center, the addition will further strengthen the program and provide students with opportunities to experience hands-on learning with an up-to-date lab and classroom space. To further strengthen the program and expand those opportunities, the district is pleased to have Edison State Community College as a partner. The collaborative effort between the college, school district, and state has led to a joint agreement that will create a pathway in agriculture that will further increase the opportunities for students to be prepared to be employed in agri-business. In doing so, Edison State was able to obtain $150,000 in appropriations from the Ohio General Assembly to be used on the project. “This project is the result of true partnerships and unselfish commitment to support the agricultural industry in our region. By combining resources, we’re able to leverage multiple sources of funding and then, along with the outstanding community support, create a center that will serve the agricultural industry on a multitude of levels,” said Edison State President Dr. Doreen Larson. With Edison State’s commitment and support of former senator Bill Beagle, current Sen. Steven Huffman, and former representative Jim Buchy, funds were allocated to Edison State for use toward for the education building project. Arcanum-Butler and Edison State have entered into an agreement that will allow the college to have access to the new facilities. “This new facility will provide Edison State with an opportunity to offer agriculture-related coursework during the evening hours. The addition of the greenhouse space will allow for potential new course development in agronomy and horticulture, which will strengthen our current Associate of Applied Science in Agriculture degree program,” said Chad Beanblossom, vice president of regional campuses at Edison State. In addition to the joint agreement, Edison State showed further support with a generous donation directly to the district for the project. The Arcanum-Butler Local School District and honorary community co-chairs Janelle Brinksneader and Phil Garbig wish to thank Edison State Community College for their support of schools and the community with their recent generous contribution of $50,000 to help fund the project. In recognition of the donation, Edison State will be given naming rights for the new greenhouse portion of the addition. 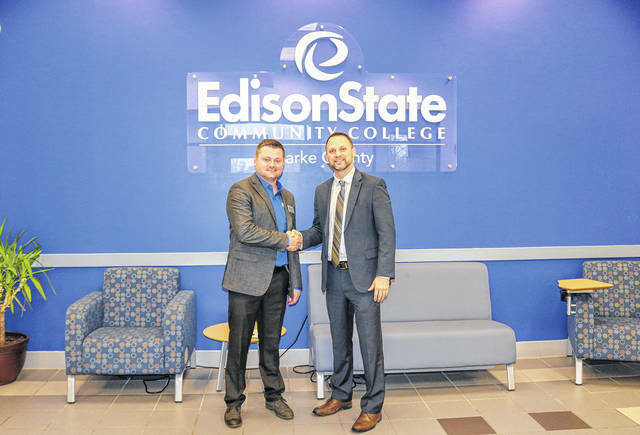 https://www.dailycall.com/wp-content/uploads/sites/30/2019/01/web1_ArcanumButlerPartnership.jpgProvided photo John Stephens, superintendent of Arcanum-Butler, and Chad Beanblossom, vice president of regional campuses at Edison State, meet to discuss their partnership of the new Agriculture Education building.